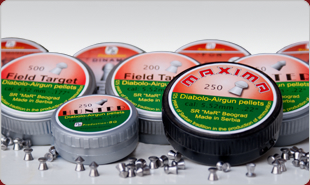 Airgun pellets are ammunition for an air gun or rifle. Pellets are usually made of soft lead or similar materials and can be produced in various calibers. The smallest calibre is 4.50 mm ( 0.177”) and the largest is 12.7mm (0.5“ ). Air gun pellets are intended for sport shooting and hunting. Flat head pellets are ideal for sport shooting. Other types of air gun pellets are used for hunting (all with large calibre, from 4.50 mm (0.177") to 12.7mm (0.5”). Our company produces several types of air gun pellets in two different calibers: 4.50 mm (0.177”) and 5.50mm (0.22”). If you are not sure which pellet to choose, please see the specifications below. FIELD TARGET 4.52 mm (0.177”) caliber and 5.50 mm (0.22”) round head air gun pellet. This pellet has been designed for long range accuracy shooting and hunting. It has been also made for strong rifles with a high initial velocity. HUNTER 4.52mm (0.177”) caliber and 5.50 mm (0.22”) pointed airgun pellet. This type of pellet has been designed for open space, long-range accuracy shooting for hunting purposes. Designed for High penetration. SPORT 4.52 mm (0.177”) and 5.50 mm (0.22”) caliber flat head airgun pellet. 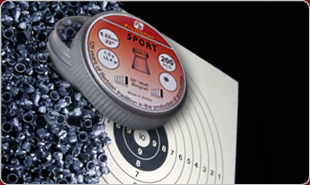 The sport pellet has been designed primary for sport shooting where good accuracy is required. MAXIMA 4.52mm (0.177”) and 5.52mm (0.22”) caliber round head heavy airgun pellets. Extrem accuracy and maximum penetrability. This pellet has been designed for hunting. DINAMIK 5.52 mm (0.22”) caliber. Dinamik is a super heavy, high accuracy airgun pellet. This pellet is known for superb penetration, maximum weight, aerodynamic configuration, high velocity and good wind resistance. CROW MAGNUM 5.52 mm (0.22”) calibre. Crow magnum has been designed for those shooters who wanted a heavier hollow point head with a gigantic forward expansion. Very good stability and accuracy. RHINO 5.52mm (0.22”) caliber. Rhino has been designed for hunting. This airgun pellet is a combination of a pointed head and a hollow point head. It Provides a maximum destroying effect, very good stability and long range accuracy.